Santa Monica State Beach on the north side of the pier is separated from the city by the palisades (an ocean bluff) and the Pacific Coast Highway. A series of bridges, walkways and stairs provide access to the beach from the city. The Annenberg Community Beach House is at the far north end of the beach, with houses and parking lots running along the Pacific Coast Highway to the Santa Monica Pier. The North Beach Playground is universally accessible, offering barrier-free equipment for increased maneuvering space, and accessible surfaces and paths. Sensory play elements such as touching, feeling, and hearing are utilized as well as swings, slides, and climbing equipment to inspire activity, mobility, and imagination in all children. In the middle of the beach, extending from Colorado Blvd and the center of Santa Monica is the Santa Monica Pier. Featuring an amusement park, aquarium, and restaurants, the pier is a landmark for the beach and the city. Santa Monica beach on the south side of the pier is level with the city, with parking lots, parks, homes and hotels bordering the beach. The original Muscle Beach (featuring gymnastics equipment), International Chess Park and Carousel Park are located just south of the Santa Monica Pier, along with Shutters on the Beach and Hotel Casa del Mar. If you are staying close to the beach in a nearby hotel or parking at an adjacent lot, walking or biking to the beach is quick and easy. Paved and lighted paths, clear signage, accessible walkways and bike lanes are available the length of the beach. Look for wooden walkways on the beach to help haul gear. Find them just south of the Pier at Crescent Bay Park, at Bay Street and Arcadia Terrace. Walkways also extend adjacent to the Pier, and at the Annenberg Community Beach House. For beachfront biking, the Marvin Braude Beach Trail runs from Pacific Palisades to Torrance. A number of bike rental and tour options are available throughout the city. Big Blue Bus day passes are $4.00 and can be purchased online or on the bus. Driving to the beach is a popular choice for many Southern California residents looking for Los Angeles beaches but roads can be very busy during the summer or holiday weekends. Learn how to go car free once you arrive. 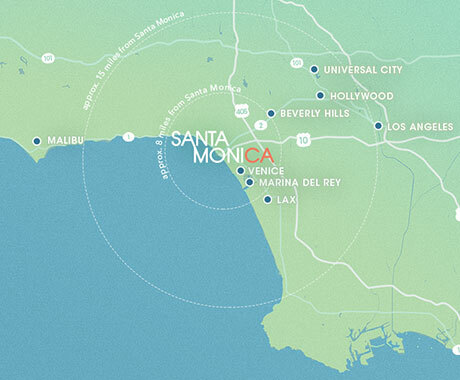 Santa Monica beach is only 8 miles from Los Angeles International Airport (LAX). By car, exit the airport and take Lincoln Blvd. / US 1 north to Santa Monica. By public transportation, take the Big Blue Bus (Route 3 or Rapid 3). Eight main parking lots are available along the length of Santa Monica State Beach, with on-street parking available nearby. Real-time parking information and a downloadable app are available through the City of Santa Monica. Many parking lots offer electric plug-in options as well. open from sunrise to sunset (with the exceptions of Lot 1N which is open from 6am to 2am and the upper Pier deck lot which is open 24 hours per day). Beach accessible wheelchairs are available through the City of Santa Monica at four locations. 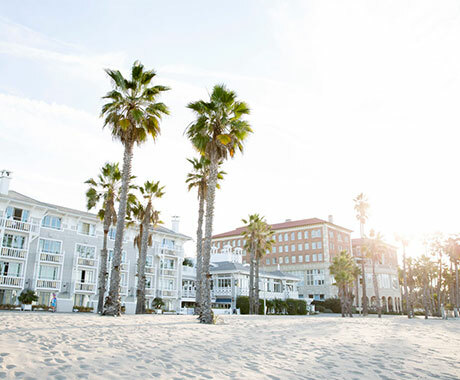 The Annenberg Community Beach House features spectacular views, a children's play area / splash pad and a historic pool and Marion Davies Guest House offering docent tours as well as classes and rentals. It is a public facility, open to all with no membership required. Back on the Beach Café is also on site and offers beachfront breakfast, lunch, and dinner. June through September parking reservations can be made online at Reserve Santa Monica, one to three days in advance. Sitting, playing and sunbathing are popular activities at the beach. A wide expanse of soft sand offers room for large summer crowds of residents and tourists. Perry’s Café and Beach Rentals (a beach rental and local restaurant on the sand with multiple locations) offers a beach butler service with lounge chairs, a small table, an umbrella, a little cooler with 2 bottles of water and a wind guard for $50.00 per day. It’s also a great spot to grab breakfast or lunch on the beach. Santa Monica beach is home to the original Muscle Beach (not the weightlifting kind, that’s Venice Beach) featuring gymnastic equipment including parallel bars, rings, swings and ropes are available for kids and adults. Numerous volleyball courts are first-come, first-served courts are situated at various locations north and south of the pier. The Marvin Braude Beach Trail (known to locals as "The Strand" or South Bay Bicycle Trail) is a 22 mile long, paved trail that starts in Santa Monica and finishes at the Torrance County Beach. A sandy beach break, a spread out lineup (the waves are not too crowded) just off of Bay St. and rentals / lessons offer beginners an introduction into surfing Southern California. View City of Santa Monica authorized surf instructors. 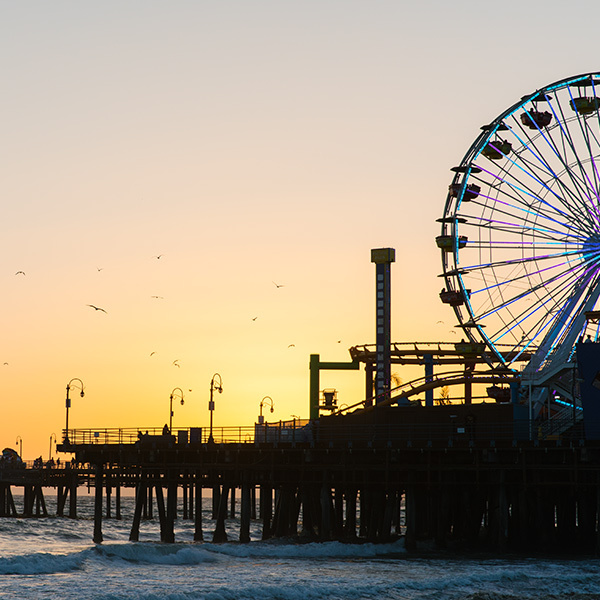 The Santa Monica Pier, International Chess Park, and Carousel Park are easy to find and centrally located on the beach. Picnic areas and parks along the edge of the Santa Monica beach are popular spots for locals and tourists. Nearby hotels, the pier and Ocean Ave. also offer a variety of restaurants, cuisines and price points. Additional locations offered along Ocean Ave. Check out a list of additional Santa Monica Beach restaurants. The summer season is the most popular time for residents and tourists to visit Santa Monica beach. average high temperature of 19°C | 71°F. Santa Monica stays warm year-round, which attracts many visitors to the Santa Monica beach during the spring, fall and winter months. average high temperature of 17°C | 65°F. No other Los Angeles beach city has as such a great variety of hotels overlooking the Pacific Ocean. Read our guide to staying near Santa Monica Beach. If you're looking to see more of Southern California's beaches in addition to Santa Monica State Beach, there are several nearby options that are easily accessible via the Marvin Braude Beach Trail. Immediately north of Santa Monica, before you reach Malibu, is Will Rogers State Beach, and just south of Santa Monica is Venice Beach. If you hop on the Marvin Braude Beach Trail, it will take you through Dockweiler Beach, Manhattan Beach, Hermosa Beach and Redondo Beach before it ends at Torrance Beach.